Trecnhfoot is a fast paced fun game with Bombs in it. 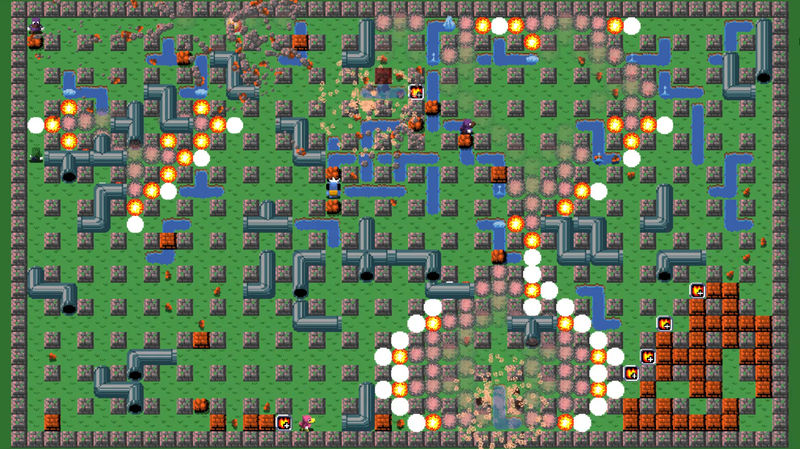 It is not a Bomberman clone! Please read on to find out why. I grew up in a family of 8 children as such local multiplayer games have always been a passion of mine. Despite the fact that Trenchfoot is very different from Bomberman and its clones, I have always loved the series. That's why I created Trenchfoot. I wanted to take the formula and add depth to it while still making it fun for less experienced gamers. A major focus of Trenchfoot is to keep the "cost" of death low. This was done to ensure that new players will enjoy it as much as veterans. Trenchfoot's explosions are dynamic. As opposed to the familiar "+" shaped explosions. Trenchfoot's explosions fill the space available to them, they go around corners and fill every little nook and cranny. Trenchfoot adds a defensive element to the game. Players can place blocks and blocks prevent explosions from expanding. Trenchfoot's explosions develop over time. As opposed to other games in this genre Trenchfoots explosions expand over time giving players a chance to react to them as they are expanding throughout the map. Combining this with the aforementioned ability to place blocks it makes for some tense and exciting moments. 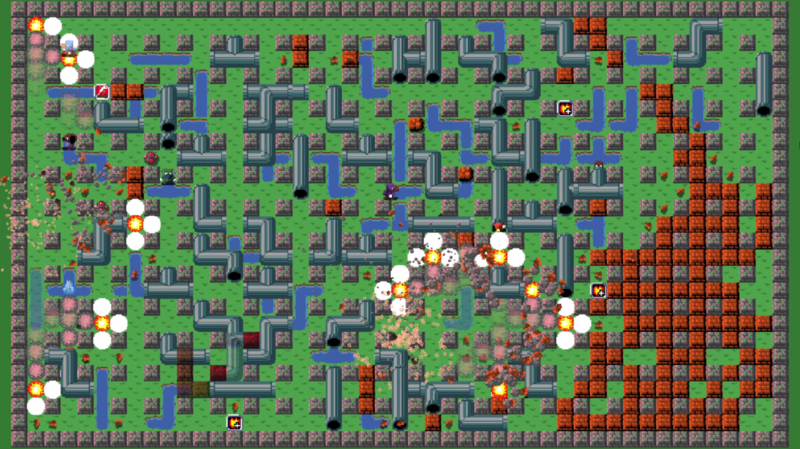 Trenchfoot's levels are dynamically altered by players. Every time a player dies they add a randomly generated feature to the level. Currently there are pipes, water, and bricks. Trenchfoot has no/low penalty for death. After a player dies and adds a feature to a map they spawn right back in where they died. This means a player is never waiting for the end of a round to continue playing. They are always in the game. Victory in Trenchfoot is determined by kills. The game tracks every kill, who killed who, how many times a player killed themselves. After a set time period the player with the most kills wins. "If you like Bomberman, Trenchfoot at 21037 might be your jam." "I ran into @MannoLovesYa, making an awesome-looking Bomberman-style game (trenchfoot)"
Cocompadres consists of a single developer making games in its free time. More information on CoCompadres, our logo & relevant media are available here.